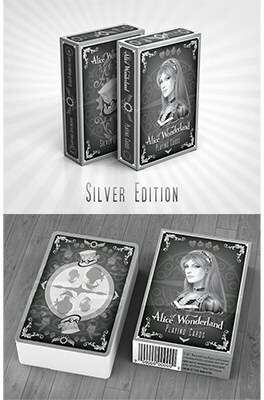 This is the second of two companion decks - Gold and Silver - which together make up a set of decks inspired by the classic Lewis Carroll book, Alice's Adventures in Wonderland, as well as the Steampunk genre. With artwork by Juan Solorzano, this project was originally crowdfunded in 2013, and finally brought to life in 2015. Note that the two companion decks can be purchased separately. 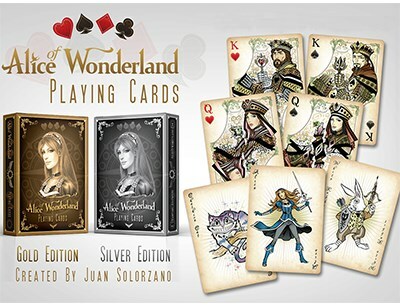 The artwork of the Alice of Wonderland Silver deck matches that of the companion Gold deck, but uses a different colour scheme. As expected, the card backs now employ a more regal and polished silver look instead of a vintage gold/brown look. Furthermore, the card faces have dispensed with the vintage style background, and gone to an unadorned white, which really makes the grey and black stand out. 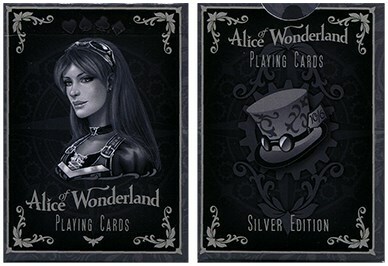 The big difference with the Silver deck is noticeable with the card faces, which use the same artwork as the Gold deck, but are now presented in a stark black and white. This emphasizes the drawings themselves, and brings to mind the famous drawings by John Tenniel that accompanied the 1865 edition of Alice in Wonderland. This impact of the simple black and white colour scheme is particularly noticeable with the court cards, which look exquisite! To ensure clarity and functionality, the pips of the Hearts and Diamonds use the traditional red, and these stand out all the more on the otherwise black-and-white canvas. Besides this change in colour, all the other details in the Silver deck are the same as the Gold deck. There's lots of customization, including the pips. and the cards are filled with artwork that harks back to the Steampunk Wonderland setting. For the Jokers, this deck takes advantage of the fact that many decks include extra cards. 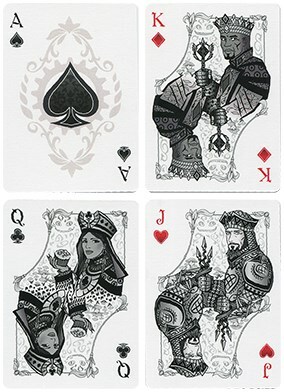 As a result, the Alice of Wonderland playing cards come with three Jokers, so you can take your pick which to use. 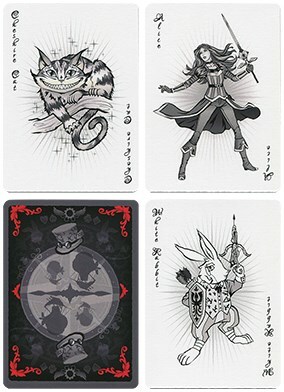 Included are Jokers featuring the Cheshire Cat, Alice herself, and the White Rabbit. These are individually labelled with character names along the sides of the cards, and unlike the court cards, depict the entire character in a one-way design. Artist Juan Solorzano certainly has done a fine job of bringing his imagined Steampunk Wonderland to life, and his characters are lively and memorable. My only concern is with the card quality. The original plan was for these decks to be printed by USPCC, but there seems to have been some major issues with the fulfilment of the project, and I'm almost certain that the published decks were printed by another publisher. The quality doesn't match usual USPCC standards, and while there is some air-cushion style embossing, it's a smoother and inferior finish that doesn't spread or fan as smoothly as one would like. Somewhat surprisingly, the Silver deck handles noticeably better than the Gold deck, perhaps because there is less ink on the cards.